Vanilla pastry cream is the classic filling for chocolate eclaires. Remove from the heat and scrape the pastry cream into a large clean metal bowl. 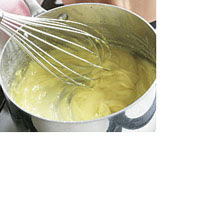 Whisk in the vanilla and then lay a sheet of plastic wrap directly on the surface. Refrigerate until thoroughly chilled, about 1 hour. Make Ahead Tips: The pastry cream needs to chill for at least 1 hour before use and may be made ahead and refrigerated for up to a day. This entry was posted on 1:57 AM and is filed under Desserts . You can follow any responses to this entry through the RSS 2.0 feed. You can leave a response, or trackback from your own site.